In hindsight I couldn’t have chosen a worse time to interview the renowned cosmologist Lawrence Krauss. With his newly released book A Universe From Nothing adorning the New York Times bestseller list, the man of the moment had become the man with no moment to spare. Our first attempt by Skype was postponed due to a photoshoot that ran late. More troubling, the next delay was caused by a break-in at his office in Arizona State University where he is Foundation Professor and Director of the Origins Project. Our next attempt to speak conflicted with a live internet stream his publishers had organized for him with Richard Dawkins. When we finally met, Krauss was remarkably relaxed and convivial, dressed in the brown suede jacket which, from what I can tell, has accompanied him on most of his public appearances for some time. Within moments, what struck me was the wide-eyed awe he retains for his subject. In fact, it was surely his infectious enthusiasm that turned his lecture on the origins of the universe at the 2009 Atheist Alliance International conference into an Internet sensation, attracting over a million YouTube hits, the success of which gave him the idea to write his latest book. 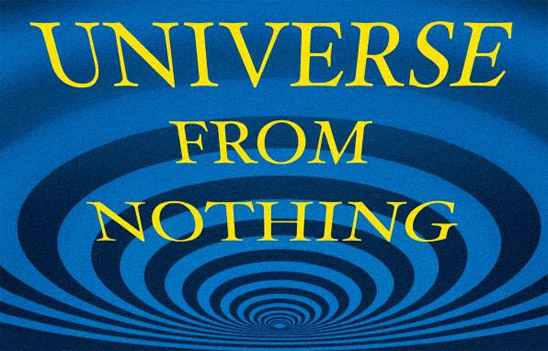 Since the book sets out to provide a plausible account for the origin of the universe—in particular one that doesn’t involve the supernatural—he could hardly have been surprised that not everyone welcomed his contribution to the subject. The extent of the flak he has received from some parts of the religious community was a recurring theme of our conversation. So perhaps it should come as no surprise that the most quoted individual in the book isn’t one of the many theoretical physicists about whose works Krauss is thoroughly knowledgeable. Instead it’s the late Christopher Hitchens, the titan of the New Atheism who was to write a foreword to the work until his illness took him from us. This is where A Universe From Nothing comes in. In fewer than 200 pages it sets out to rebut the age-old argument raised by religious apologists who contend that the reason why there is something rather than nothing is that God, outside of time and space, created both at the moment of the Big Bang. “I think it is virtually certain that everything we see came from empty space,” Krauss exposited. “And all the physics I know is highly suggestive that our universe popped into existence as a quantum fluctuation.” The book develops this by explaining that because of the laws of quantum mechanics and special relativity, empty space consisted of a bubbling brew of virtual particles spontaneously popping in and out of existence on timescales too small to notice. (It is this behavior that makes them virtual.) This was the “nothing” out of which the universe arose. These bubbling activities, known as quantum fluctuations, caused a mass density fluctuation which, in combination with the process of cosmological Inflation, resulted in the Big Bang. When you take out gravity, nothing will always be unstable with particles popping in and out of existence, but these are only virtual particles. But once you have gravity, you offer the possibility of creating something real—that is, not just virtual particles— with zero total energy. Nothing is unstable because once you’ve made something real with zero energy, quantum mechanics says you’ll always create it. If you wait long enough, no matter how small the probability is, it must arise. If you have particle pairs with a gravitational attraction that is just right for their total energy to be zero, you’re guaranteed that something will arise from nothing. That’s because nothing with total zero energy is unstable and so will create something with total zero energy. I should pause at this point to mention that when religious apologists posit God to explain how something came from nothing, a skeptical retort sometimes heard is that the universe may be eternal: Our own baby universe originated at the Big Bang but the cosmos that gave birth to it may be eternal. And so there never was a nothing from which something arose. There are numerous models that allow for this, most notably the inflationary multiverse, quantum tunneling, and two ideas based on string theory, namely the Ekpyrotic (“conflagration”) scenario and the pre-Big Bang scenario. Yet these models are barely testable, let alone proven. Krauss’ book is particularly useful in showing that skeptics don’t need to resort to these scenarios in order to deal with theist cosmological arguments. Towards the end of our conversation I reminded Krauss about the afterword to his book in which Richard Dawkins writes that if On the Origin of Species was biology’s deadliest blow to supernaturalism, we may come to see A Universe from Nothing as the equivalent from cosmology. I asked whether he worries about trying to live up to the implied comparison with Darwin, one of the greatest scientists ever. Yet before he even responded, I knew the answer. Krauss is enjoying himself far too much for that.